The 48th Patriarch of the Linji (Rinzai in Japanese) line of Ch'an, Venerable Master Hsing Yun was born in 1927 in Jiangdu of Jiangsu Province, China. The Master's original name was Li Guoshen; he later chose for himself the name "HsingYun," which means "a nebula of stars," because he sought to add his own small ray of light to the constellation of bright stars that radiate the Dharma (Pittman 270). When he was twelve years old Hsing Yun became a novice monk under Venerable Master Zhikai at Qixia Shan, a mountain monastery in Nanjing. 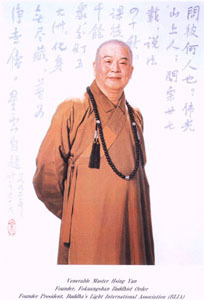 He was fully ordained in 1941 at the age of fourteen and subsequently received training at Qixia Vinaya School and Jiaoshang Buddhist College. After graduation in 1947, be attend Venerable Taixu's "Chinese Buddhist Association's Personal Training Class" (zhong-guo fojiao huiwu renyuan xunlian ban) (Pittman 270). Early in his life he committed himself to revitalizing Humanistic Buddhism, and writes in his biography that he "always meant to be a wandering monk" (Cloud and Water 8). To purify human minds through Buddhist practice. Master Hsing Yun secured the financial base of the new FSG temple by diversifying its sources of income to include royalties from his publications, agricultural rental income, surplus donations to his social welfare enterprises, income from dharma-meetings, surpluses collected from FGS sub-temples, voluntary donations from domestic and foreign devotees, and membership dues (Jones 187). The FGS movement has been extraordinarily successful; in the past several decades temples and organizations have been established on five continents in 173 countries, and now encompasses more than 13000 Monastics. The FGS International Buddhist Order emphasizes education and service, maintaining public universities, Buddhist colleges, libraries, publishing houses, translation centres, Buddhist art galleries, teahouses, and mobile medical clinics worldwide. The Order has also established a children's home, retirement home, high school and television station. Nagata suggests the multi-functional FGS complexes are "an indicator of the many institutional sub-specialists of a modern, global religious movement, from business to travel, social services to the arts and educations, conferences to tourism" (240). The infrastructure of FGS facilities is quite extensive and reflects an emphasis on modern technology and efficiency. Centres often include traditional monuments, shrine halls, meditation rooms, conference facilities, auditoria, cultural centres, theatres, teahouses, guest accommodations, media and recording studios, schools, colleges, and Buddhist souvenir shops among others to encompass the vast range of projects undertaken by the organization. The Master claims that the role of Humanistic Buddhism in providing facilities and ceremonies that are beneficial to the general public is an essential component of FGS: "If we do not take the responsibility, who will?" (Pittman 273). The extent of FGS real estate and resources is an indicator of the movement's financial power, gleaned from both time and monetary donations from followers, profits on the Master's publications, and contributions from politicians and businessmen worldwide. A trend witnessed on the international scale as well as within the local Montréal temple is that women contribute to the organization in the form of time and labour contributions, while men more often fill their financial duties and display commitments with monetary contributions. Buddha's Light International Association (BLIA) was established in 1992 as the Order's lay service organization. Venerable Master Hsing Yun serves as president of the BLIA world headquarters in Taiwan, which acts as an umbrella association for active chapters in 173 countries, making this the largest Chinese association in the world. An interesting comment from the BLIA website reads, "gradually but surely, there will be BLIA establishments throughout every corner of the world where the presence of BLIA members will make a difference for the benefit of humanity." 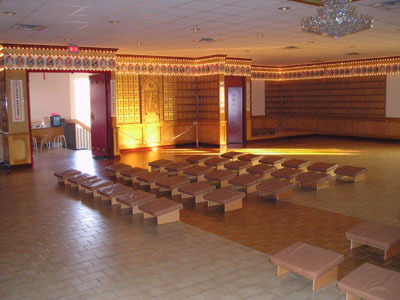 International Buddhist Progress Societies (IBPS), like the Montréal temple, fall under BLIA as their parent organization. Annually, BLIA organizes worldwide conferences and retreats that bring together various age groups, practitioners and lay people, and an array of schools of Buddhism to promote dialogue between Buddhist and other major religious groups. As an organization that considers awareness and compassion key tenents of its mission, BLIA emphasizes social services and community based work. The association is active in the "Save the Earth" campaign and the preservation of nature and the environment; BLIA regularly collects recycled products and plants trees and has participated in several governmentally sponsored activities such as an anti-drug campaign and international disaster relief efforts. Master Hsing Yun has authored many publications; his writings include over 100 in Chinese books to date, many of which have been translated into English, among other languages. His works of the Life of Sakyamuni Buddha and the sixteen-volume Fo Guang Buddhist Dictionary have won Taiwan's highest humanitarian awards. Other publications include: Handing Down the Light, Hsing Yun's Ch'an Talks, The Lion's Roar, The Hundred Sayings Series, The Humanistic Buddhism Series, Being Good: A Guide to Buddhist Ethics, Only a Great Rain, Lotus in a Stream, and Where is Your Buddha Nature: Stories to Instruct and Inspire. The Venerable Master has been called "the leader of the most vigorous, innovative, and expansive Chinese Buddhist movement of the post-war generation," as it is Hsing Yun that has put into practice the Humanistic Buddhism that Master Taixu advocated (Pittman 273). Venerable Master Hsing Yun travels quite extensively, giving lectures and performances to audiences across the globe. His humanistic message entails that to transform our world we must be actively engaged in it; wherever he travels, the Master encourages people to unite both locally and globally to achieve communities of equality, joyfulness, and peace. 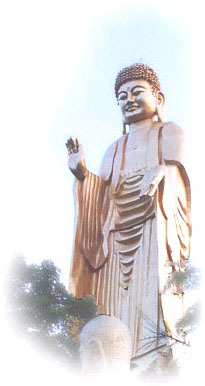 Master Hsing Yun first visited the United States in 1976 and decided to launch a Buddhist outreach campaign towards non-Asians. The Hsi Lai temple, established in Los Angeles and completed in 1987 with a 25 million dollar construction bill, marks the arrival of FGS officially in the west; even the words Hsi Lai can be translated as 'Coming to the West'. Nagata suggests the locations and names of western temples in North America, Europe, and Australia are consciously chose for their multicultural populations and evoke a sense of union among international peoples, which supports her thesis of a globalized religion (241). The BLIA base in the Los Angeles area has grown to include nearby Hsi Lai University, a fully accredited university that now offers undergraduate and graduate degrees in religious studies. Hsi Lai University claims to combine the best features of Western and Eastern cultures and aims to provide a "whole person education," in a context informed by Buddhist wisdom and values. The Hua-yen temple of Montréal was founded when Venerable Man Hung arrived in 1992. Initially established on Rue de Castelnau Est by six laymen who donated the building, the temple has since moved. The current IBPS temple is located in a fully renovated buffet house on Rue Jean-Talon Est, the site since the major move and renovations two years ago. Two Venerables reside in the Montreal temple year round, sometimes traveling back to Taiwan, and often housing visiting Monastics from Toronto, California, and Taiwan. The general standard of FGS is for Monastics to be placed on three year rotation postings so that they do not become attached to local followers and lay people or the temple and surrounding city and environment; however, Venerable Man Hung has been in Montréal since the establishment of the local IBPS chapter. The current IBPS of Montréal is, as previously mentioned, a converted buffet house. The facilities are quite extensive; the four-storey building houses the main shrine, classrooms, rooms for youth activities, meditation hall, quarters for the Monastics and several senior lay women, guest quarters, teahouse, Buddhist souvenir counter, Chinese and English library, fully-equipped office, dining hall, large kitchen, and storage space. IBPS of Montreal offers weekly ritual chanting services and dharma talks at 10:00am on Sundays. Also available on Sundays is a Buddhist philosophy class, Shao Lin Kung Fu martial arts class, Chinese language class, English language class, vegetarian cooking, Chinese cultural classes such as knot-tying and calligraphy, and Buddhist classes for adults. Several times during the week guided meditations are held in which attendees perform one hour of guided Tai Chi followed by one hour of silent meditation and personal refection. The teahouse is open to the public from 10am to 6pm Tuesday through Sunday and serves tea, dumplings, and noodles; purchase a $5 ticket at the Buddhist souvenir counter. 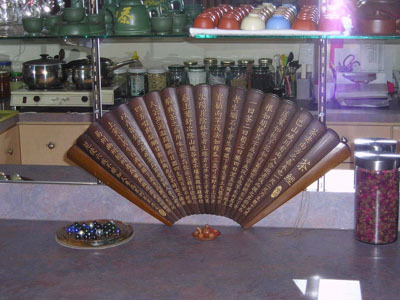 The shop sells small Buddha statues, Buddha relics, posters, small dharma instruments, bracelets, necklaces, key chains, Chinese cloth, ritual chanting recorded onto CDs, and books about Buddhism, FGS, and Master Hsing Yun among other objects. The public is welcome to read the books from the library at the temple, or can purchase a library card used to check out up to two books at a time for two-week periods. As ordained nuns, the Venerables are referred to as fa shi which translates to 'master'. As a proponent of gender equality FGS allows and encourages the full ordination of nuns; the Order has the largest number of female Monastics of any Buddhist order today. Venerable Master Hsing Yun has worked to improve the status of women in Taiwan through providing educational and leadership opportunities. In addition, FGS has sponsored several unprecedented interdenominational ordinations of nuns. The first was held at Hsi Lai in 1988, the second in Bodhgaya, India in 1998, and a third in Sri Lanka in 1999. The movement's quest for female empowerment in a religious context can be viewed as "a subtle assertion on the part of FGS of moral and political authority over, even critique of, the religious cultures, establishments and hegemonic orders of other countries" (Nagata 242). However, though nuns fulfill high positions within the FGS hierarchy and often serve as abbesses of temples throughout the world, as with the Montréal temple, when a monk is available on location to act as the abbot he is given preference over the female Monastic. Nuns are taught to understand and accept these conditions as impermanence of authority and non-attachment to top positions within a hierarchy. Within IBPS of Montréal, the nuns are responsible for the daily functions of the temple, organizing and leading Sunday services, dharma talks, and coordinating special conferences and events. These Venerables are the ultimate authority on decisions made within the temple. Members of the congregation that have supported the local establishment since its inauguration often hold high responsibilities within the temple. For example, one laywoman has been designated to run the kitchen--she oversees all the preparation, cooking, and meals on a daily basis for those working and living at the temple, and on a larger scale for Sunday lunches after the service. Another laywoman runs the teahouse located on site, and is responsible for all the grocery shopping, food preparation, service, and cleaning of the teahouse. Another is accountable for running the front desk of the temple; as such she welcomes visitors, offers brief tours, distributes information, and oversees the library among other responsibilities. The congregation of IBPS of Montréal comes largely from Taiwan and China and speaks Mandarin. 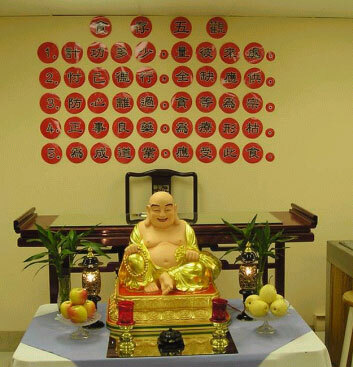 Anywhere between 15 and 30 adult members regularly attend weekly services, with as many as 100 or more in attendance for celebrations and special events, such as the Chinese New Year or the upcoming Buddha's birthday. The youth of the temple are quite young--most are children as opposed to teens. Youth do not attend the ritual chanting services and dharma talks; instead they participate in Chinese language classes, martial arts classes, or learn general Chinese culture through arts and crafts. Though many of the youth speak Chinese, most speak French or English as well, a key difference between the youth and adults of the congregation. Many of the older youth attend annual international Buddhist conferences, traveling as a group to California or Toronto to meet other Buddhist youth and begin to learn the doctrine and teachings of Master Hsing Yun. This is a trend seen across the FGS and BLIA organizations; the founding goal of propagating Buddhism through culture and education within the greater society is used as a tool to teach young children and youth the ideas of Humanistic Buddhism quite early in their development. The main shrine is where most ritual activities occur; it is a square room, oriented towards the eastern face, which I will refer to as the front. At the front is the main altar, composed of a shrine to Sakyamuni Buddha, flanked by two Bodhisattvas. Interestingly, the two flanking attendants are painted on the wall in lieu of the more traditional style in which two other statues would be placed on either side of the dominant Buddha. On this altar is a small stupa containing a relic of Sakyamuni Buddha, as well as several types of offerings, to be discussed later in this report. The hanging bells across the front of the shrine represent the musical instruments that can be found floating in the sky in the Pure Land. Behind is a wall mural with key Chinese figures depicted with their palms together or bowing towards the Buddha. Interestingly the painting includes two Westerners at the sides of the painting, a white man in a suit and a white woman with blond hair in a Western style blue dress-these almost look like Disney characters. At each corner of this dominant shrine is a tower of light; members of the congregation can make a donation to have a light lit in honour of a loved one or a wish and the member's name is placed below the light. Also at the front are the dharma instruments, including the drum to the far right, the bowl to the right of the altar, and the wooden fish to the left of the altar. To the right is a shrine to Avalokitesvara, or Kuan-Yin Bodhisattva in Chinese. Kuan-Yin's 1000 hands each with one eye in the palm are depicted by the statue of the goddess. The iconography of the water vase on the wall plaque illustrates KuanYin's association as a fertility goddess. Notice the two silver balls that flank Kuan-Yin's head-these represent the sun and moon or yin and yang, one fundamental concept of Chinese culture. 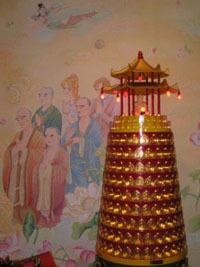 Members of the congregation can place smaller Buddha statues on this altar to receive blessings from Kuan-Yin and transfer the 'holiness' of the bodhisattva to their own purchased statue; the Venerable regards this as not central to Buddhism as she says that the blessing must come from within yourself, but she allows the practice anyway because it is what the community expects as a part of Chinese culture. An interesting detail here is that we were offered Holy Water blessed by Kuan-Yin, which was store-bought bottled water covered with an IBPS-made label indicating the blessing we would receive from the Bodhisattva. In the left corner of this shrine is a small speaker that plays recorded chanting 24 hours a day when there is not live chanting occurring in the shrine to ensure that the Buddha and bodhisattvas can always hear chanting. 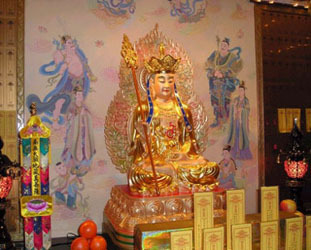 In conjunction with this shrine, smaller plaques of Kuan-Yin cover the entire right half of the room. To the left of the main shrine is a shrine for Ti Tsang, the Bodhisattva who has vowed to save all beings in hell until hell is empty, thus incorporating the Buddhist notion of the six realms of rebirth, the lowest of which is to be reborn in hell. Congregation members that have lost someone close to them make incense offerings to this shrine in an attempt to help the dead become reborn in a higher and better life. Small yellow pieces of paper with the deceased's names on them are hung behind the bodhisattva for a specific duration of time after their death in which their souls are searching for where they are to be reborn in the next life. 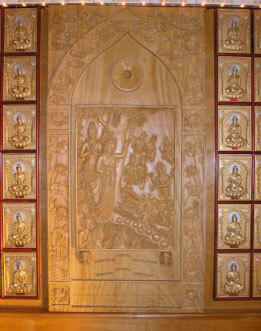 As with the Kuan-Yin plaques, the left half of the room is covered by small plaques depicting Ti Tsang bodhisattva. At the center of the room in the ceiling is a crystal chandelier surrounded by four Apsaras illustrated by their floating legs. 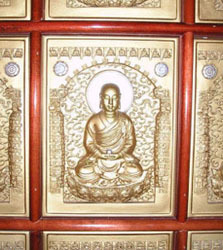 The top row plaques on the walls across the entire room are rows of five repeating Buddhas that represent each of the five directions (North, South, East, West, and Centre), which correlate to the five phases common in Chinese culture. The dress colour (green, brown, white, orange, and blue) and hand position of each (welcome, meditation, teaching, etc.) are different and correlated to each Buddha's direction. This reflects the nature of correlation in Chinese thought in its application to religion even today. In seven places around the room are spaces for sandalwood carvings of depictions of different episodes in the life of the Buddha. However, as the carvings have been warped by the Montréal weather, only one remains while the rest have been sent back to Taiwan to be repaired. The one that is intact is on the right side of the room and illustrates the Buddha's birth, including his delivery from under his mother's right side and first seven steps along seven lotus blossoms with several gods and goddesses in attendance to witness this birth. The back of the room, oriented towards the west, is filled with a stained glass window. 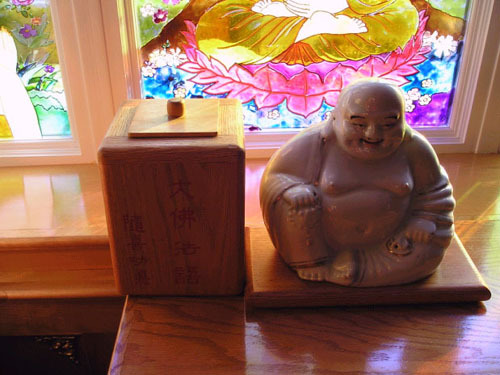 Here there is a waist-high donation box, with the laughing Future Buddha on top. 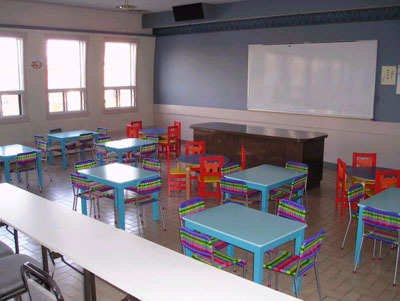 Small individual benches are arranged for practioners to kneel and sit on. They are slanted cushions designed and crafted by men of the local temple. For larger ritual occasions such as the Chinese New Year, 84 cushions were set up (seven benches across and six rows deep on either side of the room). However, for regular services fewer are set up, giving individuals more space when bowing and kneeling. These stools are divided into two sections, one on each half of the room. Ideally, men stand on the right side of the room and women on the left; however, the disproportionate size of the congregation in women to men results in some women standing at the back of the right side, behind the men. Men and women are never supposed to stand in the same row. The space directly down the centre of the room is left empty; practioners use this as an aisle when coming to the front to make incense offerings for the Buddha. It is very important to make a respectful bow towards the Buddha whenever one crosses the center of an altar, a gesture showing your acceptance and recognition of the Buddha. Another ritual space separate from the main shrine is the altar in the meditation hall. This hall is oriented towards the northern direction, which I will refer to as the front. 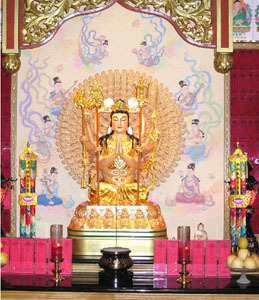 The altar at the front of the room hosts a shrine to Amitabha Buddha, Omitofo in Chinese. This is the Buddha of the Pure Land, which one part the FGS tradition. Venerable Master Hsing Yun believes that by saying the name of Amitabha Buddha or "Omitofo" followers can be reborn into the Pure Land. People in the temple say "Omitofo" as a greeting in lieu of "hello" and "goodbye". Before the ritual service, offerings are placed on each altar for the Buddha and bodhisattvas. Offerings consist of both fresh fruit and cooked food, including pineapples, Chinese pears, Chinese grapefruits, apples, kiwis, oranges, rice, and prepared root vegetables among other things. The food offering changes with each service, and are also presented each day throughout the week. One interesting observation was that one service included doughnuts in the offering! Other objects placed on each altar include freshly cut flowers, elaborate cloths, candles, and incense which is burned during the services. Another standard part of each Sunday service is the offering of food (please see description of the end of the service just before lunch). The Venerables wear black robes covered by an orange sash as a designation of ordination indicating they follow the ten precepts. If they have accepted the five precepts, lay members of the congregation wear a black robe covered by a brown sash. Those that have taken the three refuges wear only the black robe. Everyone else wears modest clothing that shows little skin. All are required to wear the slippers provided by the temple, as it is necessary to remove your shoes just after entering. 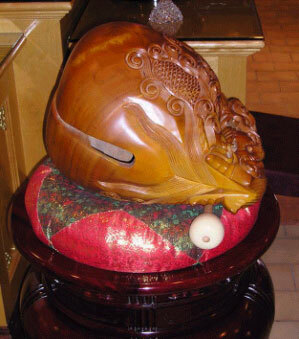 The dharma instruments at the Montréal temple include a small bell, large drum, circular bowl-type instrument that is hit from the side, and the wooden fish. Depending on the temple and location, the size of dharma instruments changes. Each instrument carries some significance; for example, the fish always keeps its eyes open, thus is chosen as a reminder to always be aware and mindful. Not just anyone can play the dharma instruments; training and practice is required before one can play during a service, and the instruments must be treated with reverence as sacred objects. However, musician-ship is not restricted to Monastics. Several lay people are required to help with the musical aspect of each service as only two Monastics cannot play all the instruments at once. The rhythm, style, intensity, and frequency with which the musical instruments are played are standard amongst all temples and services worldwide. The Monastics learn how to play correctly during their official training in Taiwan, and then teach followers within their local communities. The text used during the ritual is a compilation of sutras and verses of merit and praise to Buddhas and bodhisattvas. Books in Chinese are placed on the small stools prior to each service; members use these to follow along during chanting, though some have parts of each service memorized. Translations are available in English, which include the Chinese characters and Romanized phonetic reading. However, I found it frustrating that the English translation of the meaning of each sutra and verse was not given-it was impossible to know whom or what I was chanting for or giving thanks for as a non-Chinese speaker. Congregation members gather in the main shrine beginning about 9:45am on Sunday mornings. One is supposed to enter the shrine with a bow towards the Buddha in the entryway, and then step over the threshold of the doorway with the foot that is closest to the doorway. One is never supposed to enter through the center of the doorway, as this is reserved for the Master. 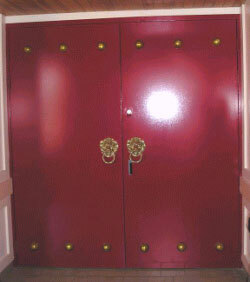 The entryway doors of the Montréal temple are just two doors wide, however a more traditional temple would have three doors. The right side is for the men to enter through and the left for the women to enter through, again reserving the center door for the Master. 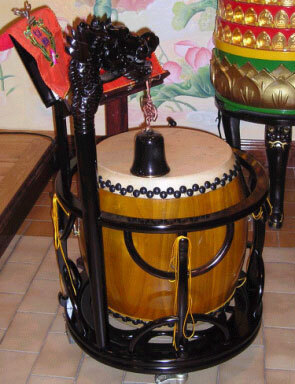 Members stand behind one of the stools with their hands in the fangzhang position, where the right hand should be on top of the left hand with the thumbtips together. 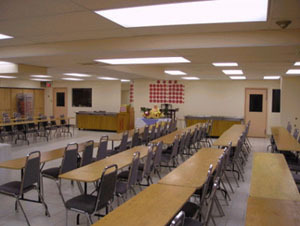 Western chairs are available along the back sides of the room for older members who cannot stand throughout the service. At 10:00am the nuns enter the room and the service begins; it is the Monastics that lead the service. The Heart Sutra is recited with several verses of praise, which takes a total of about 20 minutes. Then the names of many bodhisattvas are praised. The name of each bodhisattva is recited three times by each side of the room. While the left side of the room chants, the right side makes three full prostrations and one half bow, and vice versa for when the right side of the room is chanting. This process takes about 45 minutes. Next, during a special service like the Chinese New Year, the entire congregation will file forward in rows to make incense offerings to the Buddha. The incense is lit and distributed by women whose role it is to ensure that each service runs smoothly; these ladies tell congregation members where to stand if they are in the wrong spot, distribute booklets to those that don't have them, and guide people in the right direction for incense offerings. Offerings are made in groups of two if the present congregation is not too large or groups of five when there are many people in attendance. 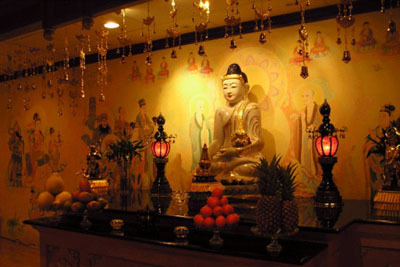 Incense offerings are first made to Sakyamuni Buddha of the centre altar, then to the left altar for the deceased, and finally to the altar for Kuan-Yin on the right side of the room. During a regular Sunday, only those who have deceased family or friends move forward to make an offering towards the appropriate bodhisattva, while the rest of the congregation remains standing and continues chanting. When making incense offerings, men always stand on the right side and women on the left. The entire congregation continues chanting while this process of coming forward and making offerings occurs. The style in which the stick of incense is carried is important: one should hold it with both hands between the second and third fingers, supporting the base of the stick with the thumb so that the stick is parallel to the floor. To make the offering one raises the stick to forehead and then places it in the pot of sand on the altar, followed by a half-bow towards the Buddha. Incense offerings take between five and 30 minutes depending on the type of service and number of participants in attendance. Following these offerings is more chanting and sutra recitation, which is done kneeling on the cushions and reading from the provided books. Chapter 1: The rabbit and the turtle race. The rabbit is sure he will win, so stops for a nap along the way. The turtle trudges along slowly and diligently, passes the rabbit while he is sleeping, and wins the race. Lesson: Sometimes your handicap (slowness, here) can actually be to your benefit. Chapter 2: They decided to race again, but the turtle gets to choose where. He decides to race down the hill. The rabbit hops off in front, and hears a bouncing sound from behind him. The noise is the turtle, who has put his head and limbs inside his shell and is just rolling down the hill, and wins. Lesson: Use what you have to succeed. Chapter 3: Again the rabbit wants to race, and he wants to decide where they race. The turtle agrees, but wants to pick the destination. The turtle decides to end the race on the other side of the road, across the river. Of course the rabbit is very far ahead, but when he reaches the river, he cannot swim, and must wait for the turtle to come and carry him across. The turtle wins. Lesson: Use your strongest points to your advantage. Last Chapter: The next year at the racing championship, the rabbit and turtle decide to race together as a team. The rabbit carries the turtle when they are racing on land, the turtle carries the rabbit on his back across the water. Together, they win the race. Lesson: Working together will always lead to success. On this day the Venerable gave a description of the hierarchy of Monastics and detailed the titles and levels of respect given to Monastics as their status changes. Also, the nun described some basic ideas of ritual spaces associated with Buddhism. For example, an represents a ritual space where monks and nuns live, yueh is a college to learn about philosophy of Buddhism, and tang is a ritual space open to the public for Buddhist purposes. The final element of a Sunday service is the Verse of Offerings before eating lunch. This verse is to remind practioners to be mindful and aware of where the food they are eating comes from and who has helped prepare and provide it for them. During this verse, an entire tray of prepared food is offered. Then a senior lay person ceremonially takes a few pieces of rice from the offering on the altar of Sakyamuni Buddha and carries it downstairs as an offering to the Buddha in the dining hall. The special instrument to do this with is a long silver chopstick with a hand on the tip. This small portion of rice is taken away to be offered to hungry ghosts. And be overfilled with the joy of the Dharma. The food varies each week, but is always vegetarian. The temple does not use onions or any other strong root vegetables, nor do any of the other FGS branches. Usually a cup of soup and fresh fruit is available as well. Everyone sits in rows and is allowed to talk. This style of eating strays from the tradition as it is upheld in Taiwan, where Monastics and visitors must eat silently in a very specific manner, always being mindful and thankful to have received the food and using it to nourish their bodies for further cultivation and promotion of the dharma. In Taiwan and other monasteries that observe stricter eating styles, it is required to finish all of your food; however, the Montréal temple does not require this and some food is thrown away. Both adult and youth members of the congregation eat together, and it is popular to bring your own IBPS bowl, cup, and chopsticks, available for purchase in the souvenir shop upstairs. Guests are welcome to eat lunch as well, and after each person clears their plates, volunteers wash the dishes. Kitagawa identifies three fundamental questions that modern religious movements today strive to answer, each of which can be seen in Humanistic Buddhist doctrine: The meaning of existence? The nature of ultimate reality? The nature of the universe? (Pittman 292). On a more concrete level, FGS is formally under the Ch'an division of Mahayana Buddhist schools; Venerable Master Hsing Yun is officially recognized as the 48th patriarch of the Linji line of Ch'an as a disciple of Taizu. 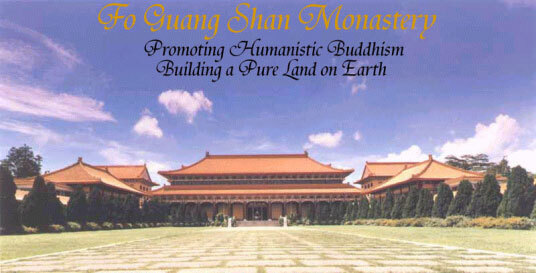 Though closely tied to the Ch'an and Pure Land traditions, FGS attempts to unite all schools and sects of Buddhism in its promotion of Humanistic Buddhism. FGS literature identifies the eight Mahayana schools in China to be: Tian-tai, Pure Land, Ch'an, Hua-yen (Avatamsaka), Fa-Siang (Yogacaran), Sanlun (Madhyamika), Dhyana, and Esoteric (Tantra). The Master fosters this unification of sectarian divisions through interdenominational and inter-religious dialogues, conferences, symposia and services. 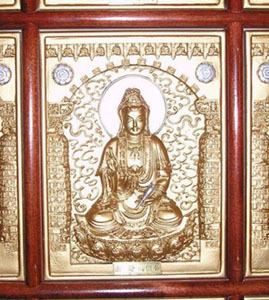 However, this rhetoric becomes contradictory in practice: the ceremony in which new members are admitted to FGS branch organizations, including IBPS of Montréal, require individuals to swear to exclusively follow the Buddha's teachings and no other religions, thereby undermining the Master's emphasis on inter-religious unity and cooperation. Promoting Buddhist teachings through cultural activities. Benefiting the society through philanthropic programs. Purifying human minds through Buddhist practices. Kindness, compassion, joy and equanimity permeate the world. Benefit heaven and earth, treasure opportunities to make friends. Practice Ch'an and chanting, cultivate morals and tolerance. Maintain humility and gratitude, making the greatest vows. Humanistic Buddhism excludes no one; the Master endeavours to achieve equality within religious organizations. Thus, the doctrine of humanism is inclusive of both male and female, young and old, rich and poor, animal and human, and Buddhist and non-Buddhist. The Master critiques the common misunderstanding that Buddhism requires giving up material goods and necessitates suffering for spiritual progress; he alternatively claims that Buddhism is about seeking happiness. Kitagawa suggests Humanistic Buddhism, as a subset of modern world religions, is more about a search for "freedom" rather than the preservation of "order" (Pittman 293-294). I undertake to abstain from destroying life. I undertake to abstain from taking things not given. I undertake to abstain from intoxicants. As mentioned above in the descriptions of ritual dress, the robes worn by members designate their acceptance of the Three Refuges and Five Precepts. Ordained Monastics must accept and follow five additional permanent precepts that require more self-discipline and modesty and embody life in a state of poverty. I undertake to abstain from eating at forbidden times. I undertake to abstain from dancing and singing. I undertake to abstain from adorning or beautifying myself with the use of garlands, scents, unguents, ornaments, and finery. I undertake to abstain from using a high or large couch or bed. I undertake to abstain from accepting gold or silver. However, I suggest the seventh precept, "I undertake to abstain from dancing and singing," is inherently problematic in consideration of the goal of Humanistic Buddhism to promote Buddhist teachings through cultural activities. When leading summer camps for small children or teaching westerners Chinese culture, Monastics will often break this precept as part of the wider goal of advancing Humanistic Buddhism. Venerable Master Hsing Yun asserts that Humanistic Buddhism is not new-it is the teaching of the Buddha himself; as such, it affirms "that the Buddha was born in this human world, cultivated himself in this human world, was enlightened in this human world and taught human beings in this human world the way to experience Nirvana in this human world and not apart from this human world" (FGS website). Hui Neng (638-713), the Sixth Patriarch of Ch'an Buddhism is referenced as saying, "The Dharma is to be found in this world and not in another…to leave this human world to search for the Dharma is as futile as searching for a rabbit with horns" (FGS website). Humanistic Buddhism encourages one to integrate the Buddha's teachings of tolerance, love, kindness, compassion, joyfulness, and equanimity into his life for his own benefit and for the benefit of all beings. To live fully in this human world and to practice Buddhism are not separate endeavours, but mutually supportive of each other under Humanistic Buddhism as one cultivates the wisdom required to clearly understand the true nature of reality. Master Hsing Yun's teacher, Venerable Taixu, once said, "when you become fully human, you will become a Buddha (who we are already)…that is the living meaning of truth" (FGS website). We are indebted to the Buddha's teachings and sincerely respect the Triple Gem; we propagate to benefit all sentient beings and strive to enlighten the world. We promote Living Buddhism and create a Buddha's Light pure land; we are pragmatic in worldly affairs and compassionate in providing relief to the world. To extend to lay followers the opportunity to support the Triple Gem, to spread the Buddhist culture, and to propagate the Dharma. To penetrate society and the human mind; let compassion, moral discipline, wisdom, and mindfulness be the source of strength for purification of the human spirit. To encourage fellow Buddhists to practice the dual cultivation of happiness and wisdom for self-enlightenment, and at the same time, rely on compassion and knowledge to benefit others. To emulate the spirit of the Buddha by being active and optimistic in dealing with life, thus giving others confidence, hope, joy, and convenience. To train lay followers in skill and wisdom through educational programs so that they too can be competent propagators. The Mahayana spirit is "to emancipate all beings prior to self-salvation." We are to follow this glorious tradition with firm conviction and a vision that extends across the world. Let us strive to realize the ideal of "letting the Buddha's Light shine over the three thousand realms and the Dharma's current flow throughout the five continents." A global person of communal living; We will be a compassionate person of co-existence. A wise person of rationality; We will be a patient person of strength. A friendly person of giving; We will be a cultivated person of purity. A joyous person of happiness; We are a Buddha's Light person of harmony. For our family, we leave behind our contributions. For humankind, we leave behind our history. For others, we leave behind our positive affinities. For the world, we leave behind our glory. IBPS of Montréal focuses services and teachings around four central texts, including the Lotus Sutra and Amitabha Sutra in morning and evening rituals, and the Heart Sutra and Diamond Sutra in recitations and in study. The Heart Sutra or Mahaprajnaparamita Hridaya Sutra, as the shortest verse is the most often recited during services, daily rituals, and other events. 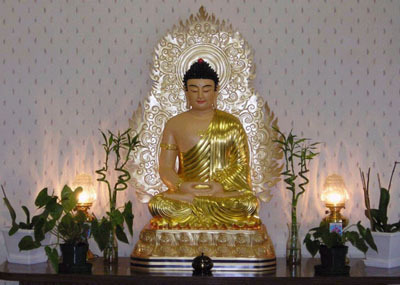 Members of IBPS of Montréal are educated about the ideas of Buddhism in several ways. The dharma talks given during the Sunday morning ritual service offer ideas about how individuals should be thinking and acting in their lives in keeping with Buddhist ideals. For congregation members that want to know more, Buddhist philosophy classes are offered (in Mandarin) for adults on Sunday afternoons. As well, meditation is considered to be one way though which individuals can achieve higher levels of understanding and realization; IBPS of Montréal combines Pure Land and Ch'an meditation practices in the guided meditation classes that are offered weekly. Another method of education for ritual service participants is to learn-by-doing. By attending ritual services each week, members first imitate and then learn the proper way to stand, chant, and prostrate. A final means by which members of the IBPS congregation are educated is through participation in spiritual conferences and meditation retreats. These are common to the FGS organization and many different types of meetings are held throughout the world on an annual basis. For example, one can attend the be-a-monk-for-one-day seminar or the larger commitment of be-a-monk-for-56-days retreat given in Taiwan each summer. These conferences and retreats bring together an international group of followers united under the name of Humanistic Buddhism; attendees not only are taught specific meditation and philosophic ideas, but are also encouraged to spread Humanistic Buddhism throughout their local communities. FGS aims to educate followers, both lay and ordained, male and female, Asian and Western from a very young age. This goal is illustrated by the extraordinary numbers of established elementary, high schools, colleges, and universities across the globe that offer not only religious studies but a comprehensive education that embodies Buddhist philosophies. I would like to that the Venerables and congregation of IBPS of Montréal for hosting Alex and I in our visits, feeding us after the services, offering literature on the Master's teachings, and giving us small gifts from the temple. Also, thanks to Simon and Bruce for providing so much valuable information on temple facilities and activities. Finally, thank you Alex, for attending ceremonies together for our research. Buddha's Light International Association World Headquarters. http://www.fgs.org.tw/english/first.htm, 12 March 2004. 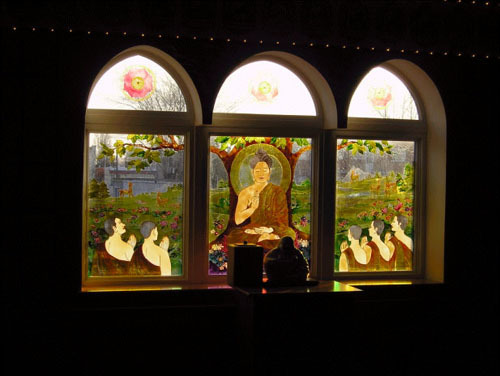 Cape Sangha: "The Five Contemplations." http://www.capesangha.org/contemplations.html, 22 March 2004. Cloud and Water, A 50 Year Anniversary Photobiography of Master Hsing Yun. FGS Religious Affairs Committee Publishing House, July 2003. Donnelly, Marie-Josée Mélanie. "Field Research Project: Buddha's Light in Montreal, A look the IBPS temple of Montreal." McGill University, Religious Studies Department; April 2000. Montreal Asian Religious Sites Project: http://www.mrsp.mcgill.ca, 1 March 2004. Fo Guan Shan. http://www.fgs.org.tw/english/first.htm, 12 March 2004. Hsi Lai Temple. http://www.hsilai.org/english/e_hsilai/temple_history/history_tradition.htm, 22 March 2004. Hsi Lai University. http://www.hlu.org, 22 March 2004. Jones, Charles Brewer. "The Period of Pluralization." Buddhism in Taiwan: Religion and the State 1660-1990 (Honolulu: University of Hawaii Press, 1999), 178-218. Morse, Simon. Personal Interviews. 1, 29 February and 18 March 2004. Nagata, Judith. "The Globalization of Buddhism and the Emergence of Religious Civil Society: The Case of the Taiwanese Fo Kuang Shan Movement in Asia and the West." Communal/Plural, 7:2 (1999), 231-248. Pittman, Don A. "Taixu's Legacy." Towards a Modern Chinese Buddhism (Honolulu: University of Hawaii Press, 2001), 255-298. Venerable Man Hung. Dharma Talks. IBPS of Montreal. 8 and 29 February 2004.